All members are welcome to attend. During this time we catch up on the latest happenings in our area and manage the business of the Chamber. All members are encouraged to attend. Promote your business at a networking event that gives attendees the chance to exchange business cards, develop new prospects and share a 60 second "commercial" with all attendees. Bring plenty of business cards – you’ll need them. 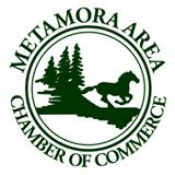 Join Chamber members at events with speakers on topics of interest to the Metamora community. Our premier event continues to be Metamora Country Days and Hot Air Balloon Festival. This popular family-friendly celebration draws thousands of visitors to our community during the the last weekend of every August. Attendees enjoy local food, music, art, a parade, crafts and activities as well as the launching over 20 hot air balloons on both Friday and Saturday nights, capped off with an extraordinary fireworks display on Saturday evening.. There are many ways for chamber members to become involved as sponsors, vendors and volunteers! This event premiered in December of 2018. It features an all equine parade and gives businesses and organizations the opportunity to wassail (toast and welcome) revelers to our community. Let us help you celebrate! Are you opening a new business, expanding at your current location, relocating, or celebrating a milestone anniversary? Let the Metamora Area Chamber of Commerce help you celebrate! A Ribbon Cutting ceremony is an important part of your overall marketing and advertising plan and is a great way to kick off a grand opening or relocation of a business. A representative of the Chamber will attend the event to cut the ribbon and present you with a certificate to commemorate the event. The Chamber will provide a press release to the County Press. Contact the Chamber to arrange for a Ribbon Cutting.